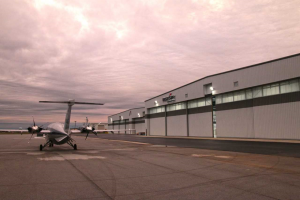 November 16, 2018 – West Star Aviation highlighted the new Paint and Maintenance Hangars at the Chattanooga facility Open House, November 7, 2018, attended by customers, vendors and employees. With over 300 people in attendance at the open house, including Mayor Jim Coppinger and Charles Wood, VP of Economic Development with the Chattanooga Chamber of Commerce who both gave remarks at the open house, the expansion is a welcome addition to the local community. With the completion of these new facilities, West Star now occupies over 175,000 sq. ft. of space at the Chattanooga Metropolitan Airport. “The open house was a great way to showcase our new facilities, and to demonstrate to our customers in this area of the country that we are continuing with our heritage of quality, world-class service,” said Jim Rankin, CEO, West Star Aviation. The recently completed expansion includes a new 65,000 sq. ft. maintenance facility that includes 40,000 sq. ft. of hangar space, and over 25,000 sq. ft. of office and support space. This completion also includes a 45,000 sq. ft.
state-of-the-art paint facility that can accommodate the paint needs of most business aircraft flying today, including Gulfstream G550, Embraer Lineage, and Embraer Legacy 600. They have input their first customer paint & maintenance project at their newly expanded Chattanooga (CHA) facility. The first customer project to be completed will include a 3C Inspection, Service Bulletins, an avionics installation and a full paint job on a Falcon 2000. This project is anticipated for completion before Q1 of 2019. “We are pleased to have our first customer in service at the new expansion to our Chattanooga facility. This completed expansion provides our team the capacity to ensure we are working efficiently, and meeting deadlines to get our customers back in the air as quickly as possible,” said Steve Goede, General Manager of West Star Aviation, Chattanooga. In addition to its facilities in East Alton, IL; Grand Junction, CO; Chattanooga, TN; and Perryville, MO, West Star Aviation runs maintenance operations at Aspen-Pitkin County Airport in Aspen, CO; Chicago Executive Airport in Chicago, IL; Centennial Airport in Denver, CO; Conroe-North Houston Regional Airport in Houston, TX; and Scottsdale Airport in Scottsdale, AZ. The company also provides complete FBO services for transient aircraft at its newly remodeled East Alton and Grand Junction facilities. West Star Aviation is an industry leader in technical experience and expertise while providing world-class customer services in all the organization’s divisions. For more information visit weststaraviation.com or call 800-922-2421.